The first part of this year’s countdown includes some of Arsene Wenger’s best performers during his time as Arsenal manager, as well as one of the most consistent midfielders of his generation who sadly left us far too soon. After becoming the first ever non-Italian to guard the posts for the Old Lady, Van der Sar left Juventus after only two seasons following the club record transfer of Gigi Buffon. For a Champions League winner who had played 400 club matches at the highest European level, proving his worth elsewhere wasn’t the talking point here. It was all about the play time and hence the Dutchman joined newly promoted English side Fulham. 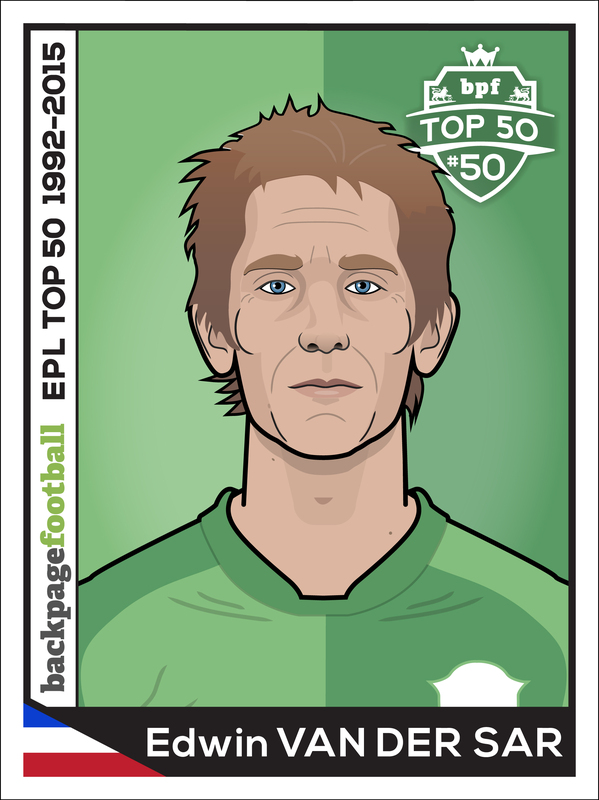 Given his physique and incredible reflexes, it didn’t take Van der Sar much time to settle in the Premier League. In his very first season he helped The Cottagers secure top flight status. This was followed by Fulham’s success in 2002 UEFA Intertoto Cup. At 34, Van der Sar was showing no signs of aging and his performances were getting better every match day. In his final season at The Cottage, he famously saved two penalties in a game against Villa to earn his side a vital point. Following four successful seasons with Fulham in terms of playing time, Sir Alex Ferguson signed Van der Sar for a mere £2 million (perhaps the greatest bargain of the last decade). 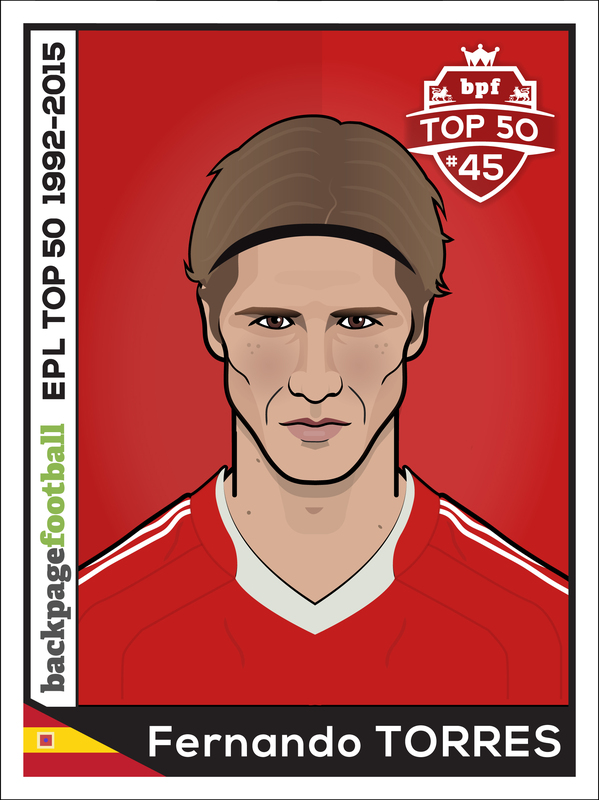 Manchester United never found the perfect replacement to fill in the shoes of Peter Schmeichel but Van der Sar proved to be an absolute steal for the Red Devils, and his arrival stabilised United’s defensive line. During the 2008/09 season, he kept 21 clean sheets, equaling the record of Petr Cech. One of his most remarkable moments in England came next season when he saved three consecutive penalties in United Community Shield shootout victory over Chelsea. The Dutchman won four Premier League titles during his six-year stay at the club. He was named in Premier League’s Team of the Season three times in 2006/07, 2008/09 and 2010/11. In 2009 he was also named the Best European Goalkeeper. The defining moment of his career arrived on that famous rainy Champions League night in Moscow, when Van der Sar teased Chelsea’s Nicolas Anelka to place the penalty to his left. Anelka didn’t and Van der Sar diving to his right saved his penalty. He wasn’t all about winning titles, and broke several records including going 1,311 minutes without conceding a club goal during the 2008/09 season. He also became the first non-British 40-year-old player to play in England. When Van der Sar retired, he was the only goalkeeper to have kept 50 clean sheets in the Champions League. 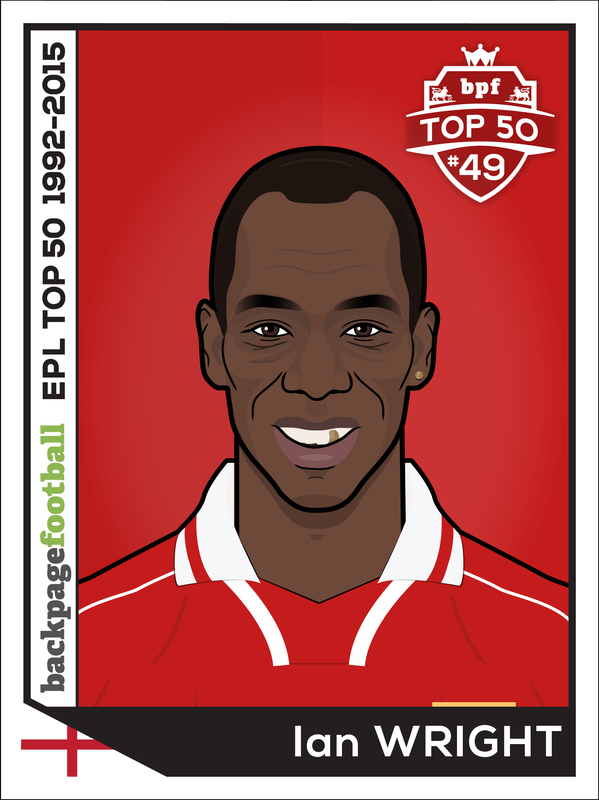 “A great goalscorer and a scorer of great goals” was the phrase coined to describe the illustrious career of Ian Wright in North London. Not only did the Englishman amass 185 goals in 288 appearances for the Gunners, but his repertoire of goals — including the most deftest of dinks, the most elementary of tap-ins or the most complex of 30-yarders — made him one of the most breathtaking forwards ever to bless the Premier League. Having smashed Arsenal’s club record transfer fee upon arrival — Wright was valued at £2.5 million despite being three years shy of his 30th birthday — many harboured doubts over the forward’s capacity to make the all-important step-up from provincial level to club football’s blue riband. Alan Smith had assumed the role of chief goalscorer after claiming the Golden Boot award twice in three seasons; Anders Limpar was a frequent terroriser of rearguards while Kevin Campbell, graduating from the Gunners’ youth academy and seven years Wright’s junior, boasted the vigour to complement the Swede’s sleight-of-hand. Unperturbed, Wright was quick to suppress the detractors, netting on his Arsenal debut against Leicester City in the League Cup before grabbing a hat-trick on his league bow at The Dell. The Englishman ended his maiden campaign having notched up a remarkable 26 goals in 33 appearances in all competitions, as Arsenal recaptured the First Division title ahead of the Premier League’s inception. League supremacy was quickly snatched by the claws of Manchester United, but Wright continued to plunder goals at an explosive rate. The 30 goal mark was eclipsed in three consecutive years following the Gunners’ First Division triumph, with the Englishman routinely exhibiting his predatory penalty-box instincts and his penchant for the spectacular. The strike that best encapsulates Wright’s panache, though, was his desecration of Leeds No.1 John Lukic that piercing afternoon in 1995. Profiting from a fortunate ricochet, Wright latched onto the ball and, after tying Leeds defender David Wetherall in knots with his enviable close-control and mental capriciousness , fashioned the deftest of dinks over goalkeeper John Lukic between the sticks to cap off a memorable display. Supporters became accustomed to Wright’s flashes of brilliance. Manchester United fell victim to the forward’s brimming ingenuity in the 1993 Charity Shield at Wembley, while Neville Southall was forced to wallow in self-pity as the Englishman manufactured one of the most outrageous solo-efforts in Premier League history against Everton later that year. After firing the Gunners to Cup Winners’ Cup glory in 1995 – Wright netted in every round except the final against Parma – Dennis Bergkamp’s arrival that summer revivified the Englishman. The forward forged an immediate rapport with the Dutchman in attack as he continued to top the Arsenal goalscoring charts. But his swan song in Arsenal colours loomed on the horizon as an injury-shredded 1997/98 campaign saw the Englishman propelled into the Arsenal folklore by eclipsing Cliff Bastin’s all-time goalscoring record. Wright required two goals that afternoon to surpass Bastin’s goal tally and, after prematurely revealing a shirt emblazoned with the words ‘179 – Just Done It’ after his opener on 20 minutes, the forward really did do it five minutes later before wheeling away in jubilation to cries of ‘Ian Wright Wright Wright’. Wright departed Highbury in 1998 sporting his first Premier League Winners’ medal. A fitting send-off for a forward who was born to score goals and who, alongside his innate penalty-box instincts, just happened to be a scorer of great ones. Marcel Desailly will be remembered as one of the most accomplished players of his generation and one of the greatest defenders of the modern era. Desailly currently resides in the country of his birth, Ghana, but began his career in France with FC Nantes’ famed youth academy. Marcel advanced to the first team and forged a sturdy partnership with current France national team manager, Didier Deschamps. Desailly’s talent was evident from a young age, his aggression and ability to read the game made him a formidable foe, hence his nickname “the rock”, and it soon became evident he would leave Nantes. Next came Marseille where he was reunited with Deschamps, capturing his first of two Champions League Winner’s medals. The second came at AC Milan, whom he joined after just one season on the French Riviera, with Desailly scoring in the final. Desailly was largely deployed in midfield at Milan, helping the Rossoneri to two Serie A’s, two Italian Super Cups, a UEFA Super Cup and of course of the Champions League, making him the first player to win the cup in consecutive seasons with different clubs. The rock’s transition to the Premier League with Chelsea was not as smooth as one may have imagined. Indeed, Desailly had even been accused of saving his best performances for the European stages. However, Desailly would silence the doubters wrong in the closing months of his first season, highlighting his capacity to motivate those around him and lead a team as captain. 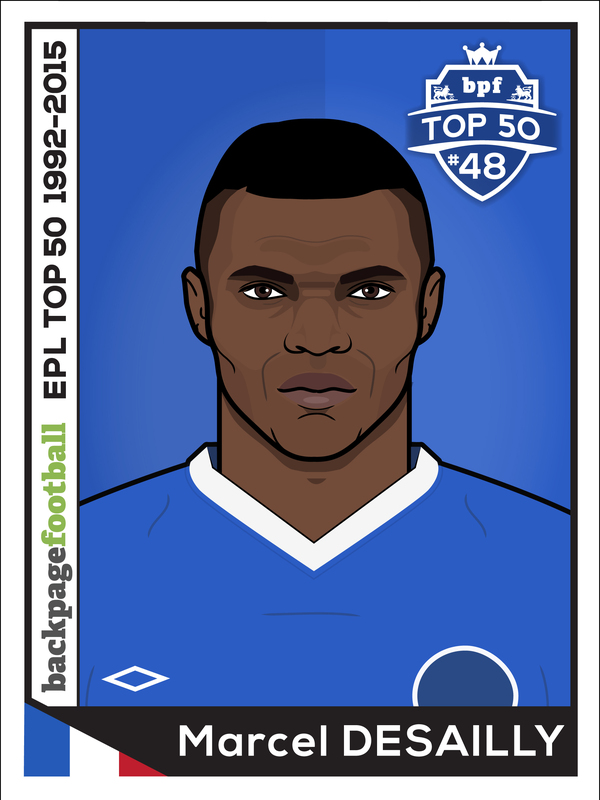 Desailly ended his first season in West London with another UEFA Super Cup. As expected Desailly would win both the trust and hearts of the fans in his six seasons with Chelsea, leading the blues to a historic FA Cup, the last hosted at the Old Wembley Stadium. On the international front Desailly was a stalwart for France, despite the controversy surrounding his choice to play for France over Ghana. Desailly was a vital cog of the World Cup winning team in 1998, albeit being sent off in the final. Two years later, he won Euro 2000 and was made captain after tournament. Desailly ended his international career with a record number (116) of appearances for France, later to be surpassed by Lilian Thuram. The 90s was a difficult time for Liverpool. Following their dominance in the 1980s, the Reds won a single FA and League Cup in the 90s and the “Spice Boys” stories dominated the back pages. To inspire his side, Roy Evans looked to the academy. Enter Michael Owen, the 17-year-old prodigy who took the Premier League by storm in his first season as a regular in the starting XI. At the expense of an injured Robbie Fowler, Owen played in 36 league games, scoring 18 goals as he tormented defences with his mixture of pace, control and precision finishing. Liverpool’s title challenge petered out in April, but Owen finished the season with both the Premier League Golden Boot and PFA Young Player of the Year award. The peak of his career came in the 2000/01 season at the tender age of 21. While Liverpool achieved a respectable third in the Premier League, Gerard Houllier’s side completed a famous treble, winning the League Cup, UEFA Cup and FA Cup, with Owen’s crucial double helping to win the latter. A Ballon d’Or win followed in recognition of his accomplishments. But Owen’s fairytale start in football was also instrumental in his decline and decision to retire from the game in 2013. An anterior cruciate ligament injury in a 2006 World Cup match against Sweden, along with other niggling injuries, robbed him of his pace and Owen was happy to play second fiddle at Manchester United. Had it not been for injuries, he may well have broken Bobby Charlton’s goal-scoring record for England before Wayne Rooney. Owen’s career as a player is defined by his initial success and the thought of what might have been. But for those years before injuries took over, he was a shining light for a Liverpool side that had started to lose its way. There are a handful of Premier League-era players that can truly call themselves one-club players. It takes a phenomenal dedication, passion, consistency and, above all, a phenomenal loyalty to achieve such a feat, and Liverpool’s Jamie Carragher is one. A striker as a schoolboy, Carragher was quick and clinical but small in stature. As his early years progressed he transitioned into a midfield role, before finding himself at home as a defensive player when establishing himself in the Liverpool reserve side. 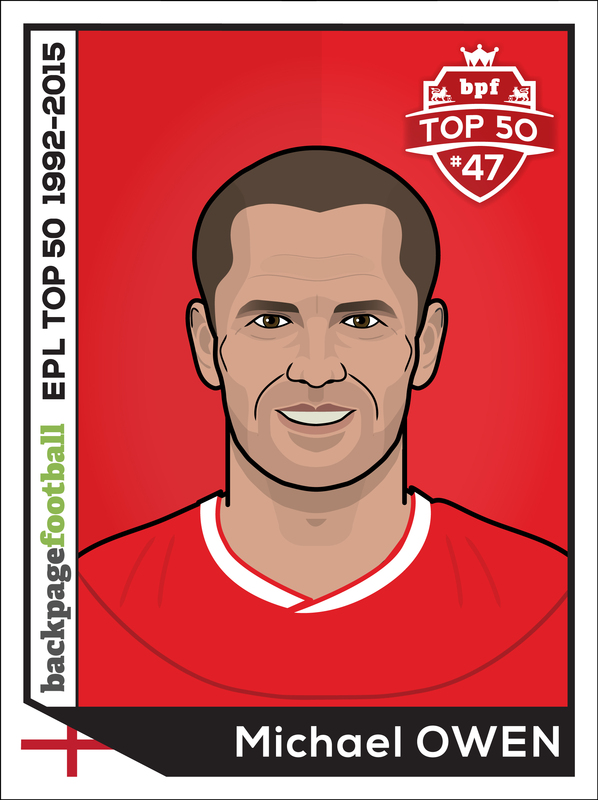 Carragher made his debut in January of 1997, under Roy Evans, and scored his first goal for the club just a few weeks later. This was to be one of his four Premier League goals in 17 Premier League campaigns. The defensive stalwart began to establish himself in the squad in the 1997/98 season, performing usefully as a utility player across the back four and sometimes at defensive midfield, but he didn’t begin shining until the arrival of Gerard Houllier in 1998 when Carragher played 44 times and won the club’s Player of the Year award. Houllier never saw him as a centre back however, and while Sami Hyypia and Stephane Henchoz formed a formidable pairing, Carragher found himself at right and left back. It wasn’t until the arrival of Rafa Benitez in 2004/05 that Carragher truly developed into a world class centre back. His no-nonsense approach may not have been pretty, but he was strong, positionally astute and phenomenally passionate and became part of the wonderful spine the club built during the Benitez era. Carragher’s crowning achievement was winning the Champions League in 2005, where he had two last-gasp intercepts in extra time whilst suffering from cramp. Despite some efforts to oust him from his position late on his career, Carragher always found himself back into the side and never looked out of place. In his entire career, the Sky pundit never played less than 30 games in a season – totally 508 league appearances and over 700 in total. 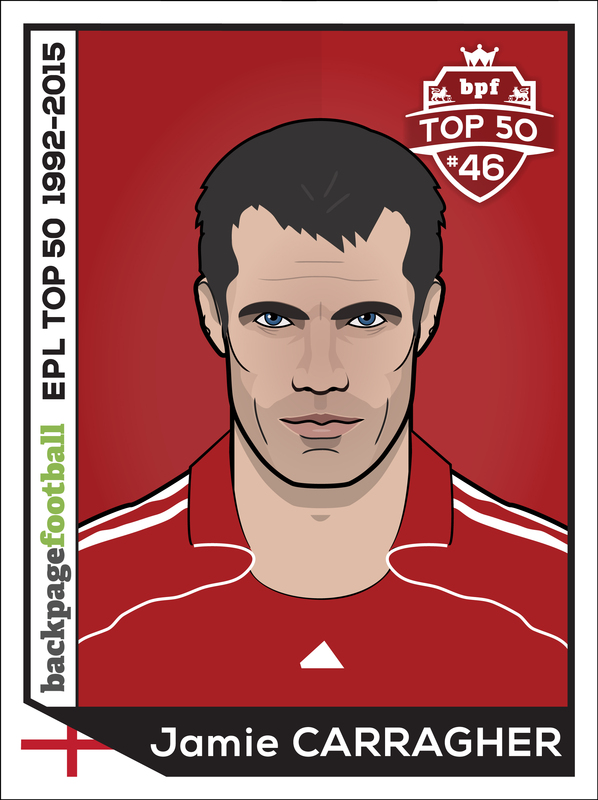 A Premier League legend who still finds himself gracing our screens every week, Carragher was a truly legendary defensive stalwart and proved this whether at centre back, right back or left back. Few portrayed passion and determination as strong as he did, while even fewer can call themselves a one-club Premier League legend. Rewind six or seven years ago, and Fernando Torres was simply one of the best strikers in the World. His pace, his determination and his eye for goal meant he was feared by every single defender he faced. Just ask Nemanja Vidić, one of the Premiership’s best centre-halves, who was made to look like a really bad schoolboy by Torres, on more than one occasion. All of the above may be hard to believe to the younger fan who missed Torres’ prime at Liverpool. A £50 million move to Chelsea was good timing for Torres, who had entered a bit of a rut, but his form only declined at Stamford Bridge. He struggled to 20 goals in 110 appearances, dire compared to his 65 goals in 102 appearances for Liverpool. On Merseyside, though, watching Torres was a joy. The way he latched onto Pepe Reina’s quick, long kicks were a joy to behold. The way he linked up and brought out the best in captain Steven Gerrard was truly special. El Nino brought excitement to the red half of Merseyside and was truly adored. It’s testament to Torres that the likes of Gerrard hold him in the same category as Luis Suarez, arguably the best Premier League footballer of the last decade. It just felt like every time I went onto the pitch with him, I was going to play well and that I was going to create goals for him. And when you’ve got that feeling, it’s so enjoyable to play football. Gerrard was right, Torres at Liverpool made things happen and gave that belief to the supporters and his team-mates. His spell at Chelsea may have tarnished his reputation amongst Premier League fans, but there’s underestimating how deadly Fernando Torres was at Liverpool. If Marc Overmars was signed in this day and age, the Arsenal Twitterverse would go into meltdown that Arsene Wenger signed yet another injury prone player. Thankfully social media isn’t as rampant in 1997 as it is today as Wenger signed a player that helped etched Arsenal’s name on the Premier League trophy. The Dutchman had only come back from a long-term layoff with a cruciate ligament injury when it seemed that Ajax Amsterdam didn’t want to take the risk with him. Wenger took a giant leap of faith and reunited the winger with Dennis Bergkamp whom they spent a season together at Ajax on top of numerous international assignments. The impact that Overmars bring to an already slick Arsenal team was his lightning speed and he instantly became a counter attacking weapon. Bergkamp developed an instant understanding with the pint-sized Overmars and Premier League defences struggled to cope with the combination play of these two. 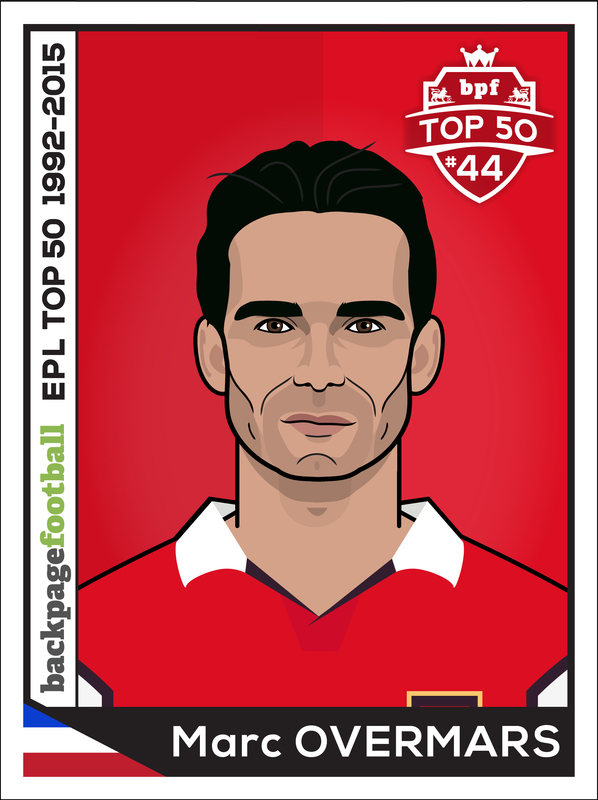 Gooners would remember fondly one particular contribution of Overmars during that successful league campaign was that all-important match at Old Trafford. Arsenal hauled back a nine point gap to Manchester United that was highlighted by Overmars’ goal that was also the first that the Gunners has scored there in the Premier League era. Overmars would stay for just another two seasons at Highbury as top clubs around the world sat up and reassess their previous view on his health. The three seasons saw Overmars involved in over 30 leagues games each season. While he couldn’t help Arsenal retain the title, he was still a thorn to many defenders. It may have been a short sojourn on the English shore but Marc Overmars’ definitely left a big imprint. Carlos Alberto Martínez Tevez entered the Premier League in August 2006 under a cloud of controversy. In 2013, he left under a cloud of controversy. Hurricane Carlitos. His seven years in England were a whirlwind of controversy, brinksmanship and fines. But look beyond the tabloid headlines that swirled around the Argentine and you’ll find a beating heart of filled with passion – ask supporters of any of the three clubs what the stocky, scarred, tenacious boy from Buenos Aires means to them and the response will be one of fondness, perhaps even love. A study of his career in England offers ample evidence to suggest the strength of feeling – his first goal for West Ham, a perfect free-kick versus Tottenham, resulted in a shirtless Tevez bounding into the Upton Park crowd. At Manchester United his he formed a deadly attacking triumvirate along side Wayne Rooney and Cristiano Ronaldo, his apparently unresolved contract situation prompting booming calls from the Old Trafford faithful for Ferguson to “sign him up!”. And then, more controversy. “Welcome to Manchester” proclaimed the sky-blue billboard intended to rile the red side of the city. 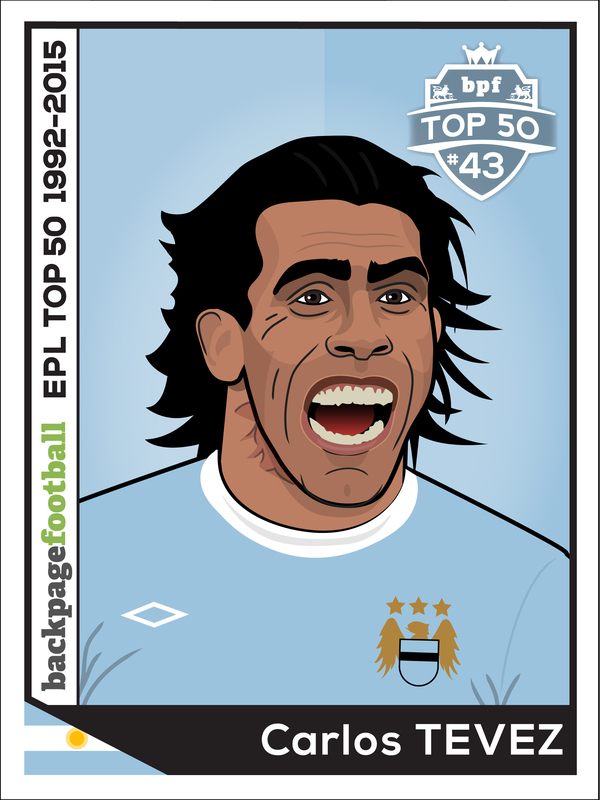 The player chosen to illustrate that Manchester City meant business – Carlos Tevez. The numerous controversies and contract sagas, culminating in Munich, dominate memories of Tevez’s time at Eastlands, despite him being made captain in his second season and becoming the second fastest player in City history to make it to 50 goals. In the seven years in the Premier League Tevez made over 200 appearances, scoring 84 goals and lifting the title three times. One wonders that perhaps, without the obvious interference of his agent Kia Joorabchian, ether Tevez’s career could have propelled him higher up the ‘greatest ever’ lists. On the other hand, would the trappings of greater success – more trophies or contract bonuses – mean anything to a player who seemed to only want to play for the love of the fans? 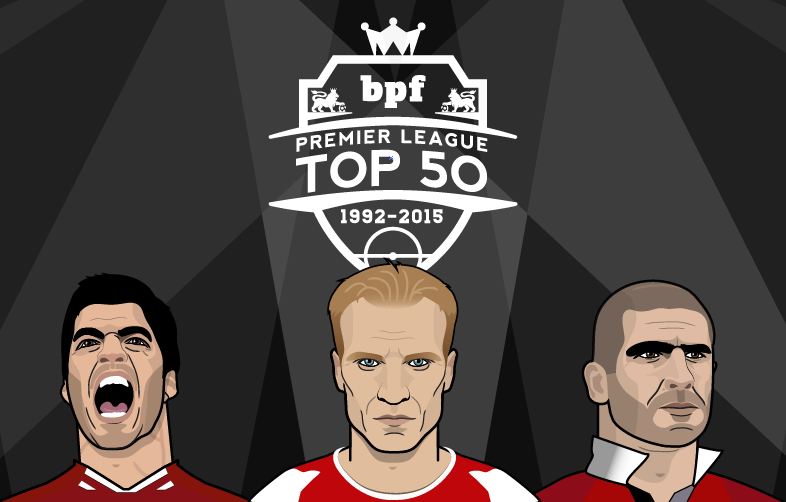 In this Top 50 there will undoubtedly be more successful players higher up the list. There will also be players who enjoyed greater longevity in the Premier League. However, there will be very few players who can stake the claim for greater impact at their respective clubs in such a short amount of time. 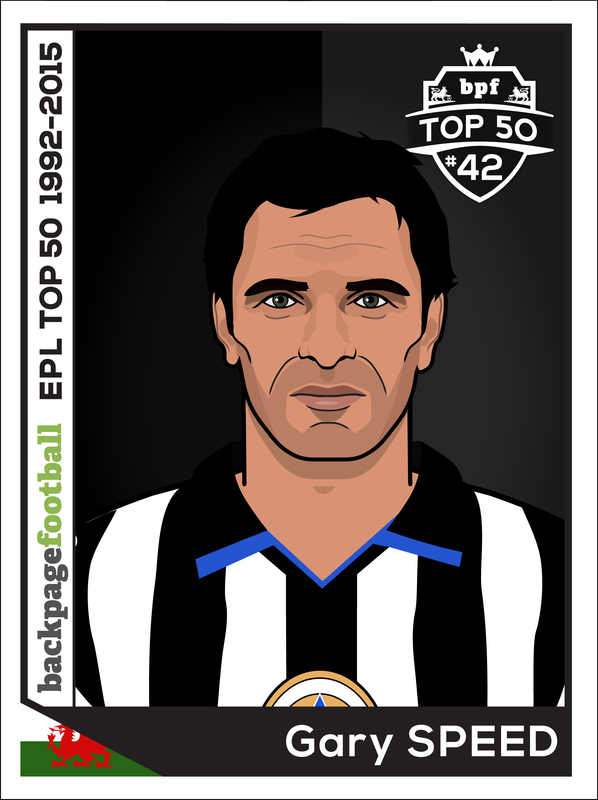 One can read the early history of the Premier League in the story of Gary Speed’s career. He was the youthful, attacking spirit of the Leeds midfield quartet of Speed, Batty, McAllister and Strachan that helped deliver the last league title of the pre-Premier league era to Elland Road. A versatile performer featuring as a wing back, winger, central midfielder and even as a sweeper, a role he regularly fulfilled for the Welsh national team it was Speed’s consistency that ensures his position as a Premier League legend. It was this drive and consistency that would see him become the first player to make 500 Premier League appearances and in 2007 his goal against Reading meant that he had scored in every season of the Premier League since its inception. That other Welsh veteran of the Premier League, Ryan Giggs would later surpass both these records but it’s worth remembering that at international level Speed became Wales most capped outfield player while Giggs’ infamous international absences meant he won only 64 caps in a 16 year international career. Entering the Premier League as defending champions Leeds’ next seasons were far less successful and even the final of Gary Speed’s more than 300 games in the white of Leeds would also end in disappointment as they lost 3-0 to Aston Villa in the 1996 League Cup final. Maybe I stayed at Leeds one or two seasons too long. Maybe I need a move to get my career going again but that’s all behind me now. Things started well for Speed, he scored on his debut for the club and finished the season with 11 goals in all competitions and was named the clubs Player of the Year. Everton continued to struggle although Speed was made captain by the returning Howard Kendall the following season Speed left in somewhat acrimonious circumstance moving to Newcastle for £5.5m. Speed’s time at Newcastle was more successful and he got to play in the Champions League again in 2002/03 as well as featuring in back to back cup finals in 1998 and 1999 but finished on the losing side on both occasions. Sam Allardyce, always one to spot a quality veteran footballer who still has a bit to offer, signed up a 34-year-old Speed for Bolton in the summer of 2004 and Speed continued to be a key performer as the club enjoyed three seasons of consecutive of top ten finishes in 2008 as a nearly 40-year-old Gary Speed finally began to wind down his top flight career. Trophy wise Speed’s career peaked in his early 20s before the dawn of the Premier League however even in struggling teams Speed was an exceptional performer, consistent, versatile, a goal threat and an on-pitch leader. Sometimes there really is a situation where you are lucky enough to find the last piece of the jigsaw. At that point Ferguson knew the title would be returning to Old Trafford, and there was no denying who the key factor was. Since his early days on the streets of Rotterdam, Robin Van Persie always seemed destined to play on the highest stage. Van Persie played for his local club SBV Excelsior until he was 16, and despite his petulant attitude causing problems, the club clearly thought a lot of him. In 2010, one of the stands in the Stadion Woudestein was named after him. At 17, Van Persie made his debut for Feyenoord, and despite clashing with coach Bert Van Marwijk, he helped them win the UEFA Cup in their own stadium in 2002, before moving to Arsenal in 2004. Arsene Wenger converted Van Persie from a winger in to centre-forward, and once Thierry Henry left the Gunners in 2007, the Dutchman took over where the Frenchman had left off. 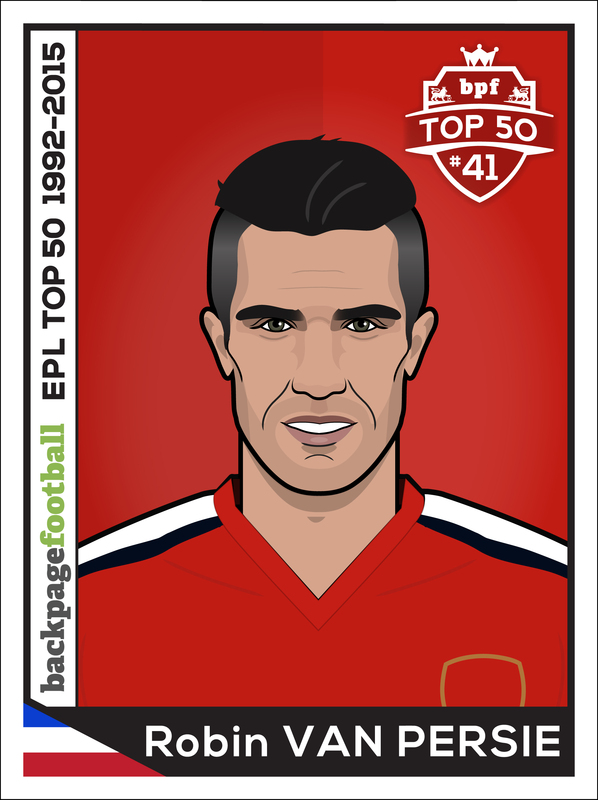 From the start of the 2007-08 season until his departure for Manchester United in 2012, RVP scored 75 goals in 122 Premier League appearances for Arsenal. Seven years without silverware at the Emirates Stadium left Van Persie frustrated, and at 29 he handed in the captain’s armband and made the controversial move to United for £24 million. With RVP in the team United had their swagger back, and a record 20th league title – Van Persie’s first – followed. The Dutchman quickly became a cult hero at Old Trafford, but with Ferguson’s sudden retirement, his performances would decline under David Moyes and then Louis Van Gaal. In the summer of 2015, RVP left England after 11 years, and with 145 goals to his name he is the tenth highest scorer in Premier League history. Where did he place on the list of votes you submitted? Ronaldo isn’t in the list. You are smoking.